O. T. Frasch Image 647 - Hamilton Blg. Georgetown Wash. Image 647 - Hamilton Bldg. Georgetown Wash. This was a new building when O. T. Frasch took a picture of it - erected in 1907. Upstairs are offices for a surgeon and a lawyer. Downstairs has a drug store, a U.S. Post Office, a bank, and The Bee Hive Store. Trolley tracks run down the middle of the street with wires overhead. At the top is a sign for Hamilton's Hall with the date 1908. It is difficult to tell from this perspective whether the sign is part of this building or not. The ghostly image of a man is visible in the bank window; he is apparently standing inside. 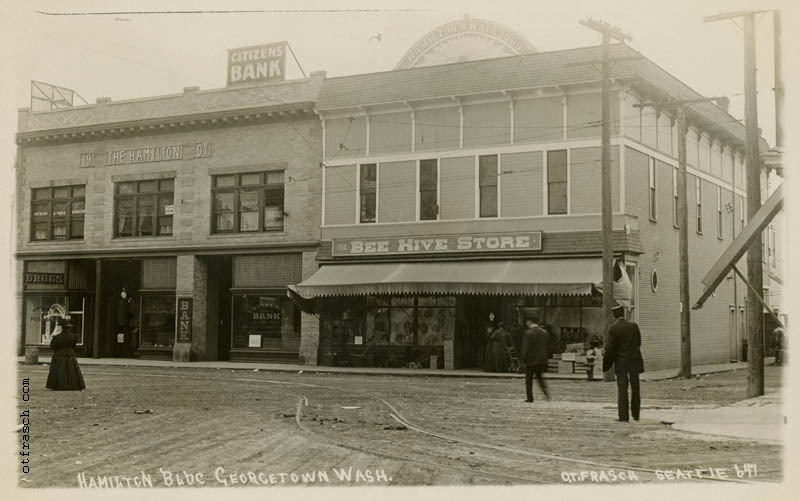 Three instances of the letter 'G' in "Bldg" and "Georgetown" look more like 'C' than 'G'.